Former WWE Superstar Simon Dean talked to The Hannibal TV about current Universal Champion Brock Lesnar. Dean expressed his opinions about how Lesnar should be booked in WWE, and called him the most dominant wrestler there's ever seen. "My interactions with Brock were real short," Dean revealed. "'Hey Brock, how are you doing?' 'Hey man, how are you doing?' That's it. No long-term stories. Apparently when he was here, he used to drive the ring-truck, he had a good workout, they showed up to practice every day. It's not a shock, I mean, the guy didn't become NCAA Heavyweight Champion by accident. I think overall, he's the most dominant professional wrestling athlete there's ever been. When you look at his pedigree and what he has accomplished, he's the biggest pay-per-view draw, him and Floyd Mayweather in the last two decades. 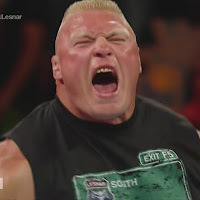 "So Brock's an attraction. You'd devalue him if he was wrestling four, five, six times a month. He's not built for that, number one. It's not believable, number two. And if you put him in the ring with just about anybody except Braun Strowman, it's not even close… or maybe Roman. It's not even close to being believable that he wouldn't beat that guy in ten seconds. So you have to keep him as a special attraction. When he comes out, it should be like, 'Oh my God, he's here!' Like a heavyweight prize-fighter." Simon also gave his thoughts on Brock's role in WWE, and if he was worth the money the company is paying him. "He's worth every single dime what they pay him. He brings in buy-rates, and you're not hiring Brock to go there and have a five star Meltzer match, where everyone's like, 'Oh my God, that's incredible!' He's an attraction, he puts butts in seats. People forget, this is professional wrestling entertainment. It's sports entertainment. If it was real, Brock Lesnar or Kurt Angle would be the champions and no one would ever beat them, or the Big Show. That's it."